This Is Your Captain Speaking: Where are the Pilotless Airliners? Where are the Pilotless Airliners? Peter Thiel, PayPal founder and tech evangelist, noted several years ago that "We wanted flying cars, but instead got 140 characters." He was, of course, talking about Twitter, but his larger point was that the technological advancements that seemed to be inevitable have—when they've even shown up— been underwhelming. The pilotless airliner, like the driverless car, is one of those innovations that always seems to be close, but like a mirage in the desert, keeps receding into the distance. And it certainly isn't for lack of effort. DARPA has recently been testing a robot which occupies the space where a copilot sits on an airliner. A recent headline proclaimed that this robot was able to fly (and land!) a 737. So that's that right? We can finally get on with the business of halving (or eliminating) our pilot force, solving the pilot shortage, and saving a ton of money to boot. Well, I wouldn't be so quick to quit flight school and dust off that medical school application. We are still quite a ways away from single or no pilot airliners for a number of reasons. But first, I'd like to review where we've come from when it comes to cockpit automation and what we'll ultimately be asking our machines to do. There was a time not too far removed when it took five or more crew members—in addition to flight attendants—to operate an airliner. Besides the two pilots up front, there were navigators to navigate, flight engineers to keep the engines running, and a radio operator to communicate. Over the years, these positions have been eliminated through the use of technology and automation. The last airplane Boeing manufactured that had an engineer's panel in the cockpit was the 1960s era 727 which ceased production in 1984. Navigators and radio operators were eliminated decades earlier, replaced by inertial navigation systems and solid state radios. I think it important to note that none of the functions that those earlier crew members accomplished were actually eliminated, but rather consolidated into the job of pilot. Airplanes still needed to be navigated, engines needed to be started, monitored and kept running through fuel management, and radios still needed to be tuned and monitored. Automation has allowed pilots to assume all those duties while still flying the airplane. And as you've no doubt read somewhere on the internet, pilots only actually "fly" their airliners for just a few minutes per flight during takeoff and landing. For the most part this is true. I personally like to hand fly the jet more than most, but that is because I enjoy it. There is certainly no need to do so. For many, it is gear up, flaps up, autopilot on. The dirty truth is the autopilot can fly better for longer than any human can. Sure, some pilots can fly a better final than "George" (the autopilot), but George doesn't get tired or rusty. This is a good thing, because it is that autopilot which frees up the two pilots to deal with things like a low oil pressure light during a diversion in bad weather. Why Have Pilots at All? Technology has eliminated all those other jobs on the airplane, and we have autopilots that routinely handle almost all the flying already, so what's the problem? Just make a machine that can handle the other three minutes of flying and we're done here. We will only need to write some software that can handle the decisions that pilots are expected to make. This gets down to the question of things that machines do well versus the things that humans do well. They each have their strengths and weaknesses. Computers are really good at tedious detail work such as, say, doing a spell check or a word find and replace on a blog post. What they're not so good at is deciding if you've buried the lede, or if your prose is somewhat leaden. That takes judgement, which is more difficult to code. Have you ever wondered why all the fruits and vegetables in the supermarket have those little stickers on them used by the scanner? Why can't the scanner just look at a tomato and recognize it? The reason is that when you program the computer to recognize something that is "red" and "round" it will confuse tomatoes with apples (or red bell peppers). While humans will rarely mistake an apple for a tomato, getting a machine to routinely recognize the difference is more difficult, (and expensive) hence the stickers. In short, humans are much better than machines at pattern recognition and heuristics, which is a fancy word for an educated guess or hunch. Humans are better decision makers in ambiguous situations. And many situations on an airliner can be ambiguous. What is software other than prepackaged expertise and decisions? Automation is threatening whole sectors of the economy such as accounting because expertise and best practices can be distilled into code and sold to people who couldn't otherwise afford to hire a tireless expert. Accounting software, though, is unlikely to be presented a scenario which hasn't been preprogrammed. If it does come across such a situation, it would likely come to a halt state to await human intervention. 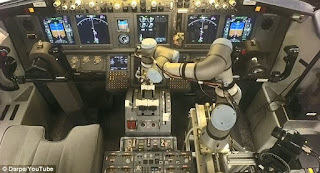 The software in a pilotless airplane would need to be either pre programmed with every possible scenario likely to ever be encountered, or to employ some sort of artificial intelligence. Artificial intelligence (AI) is the ability of a machine to be able to process information which it hasn't specifically been programmed to handle, i.e. to learn. In short, it is canned judgement. Advances in AI are being made all the time but it does have a way to go. Imagine a piece of software which would have the judgement to tell the difference between a need to do a gate return for a woman who'd left her purse in the gate area versus one whose husband had been seriously injured (or one of several million other scenarios). I can't imagine that either. So it seems apparent to me that we're going to need humans available to make decisions on or about airliners for the foreseeable future. The question arises as to how many humans are required, and if they should they actually be on the airplane. Our current commercial airline transportation system consists of at least four people watching over your flight at any one time. Two or more pilots are up front, a dispatcher has planned your flight and keeps watch over things like destination weather and other operational concerns, while air traffic controllers keep your airplane away from all the other airplanes flying around. All of these jobs are supposedly ripe for replacement through automation. Back in my military days my crew would come in the day before a scheduled flight and spend the entire day flight planning. Dispatchers today plan and oversee many dozens of flights per shift using sophisticated software tools. They become extremely busy, though, when many airplanes under their control have to divert in the case of bad weather in one location. Similar automation and technology advancements are impacting the job of the air traffic controller as well. The FAA has proposed using advanced data tools to have a flight fully cleared and deconflicted from all other airborne traffic before it has even taken off. Controllers would only be available to intervene in the case of rapidly changing weather or other unpredictable contingencies such as aircraft emergencies. In the most likely interim single pilot scenario, one pilot aboard an airliner would be coupled with a "copilot" assistant on the ground connected through datalink. A decision would need to be made as to how many airborne planes would be assigned to each assistant. If the ratio is one to one, there would be little cost savings as assistants would likely make about as much as copilots currently do. Perhaps two to one or four to one. An optimal number will need to be found though this would open a new cost versus safety frontier that does not now exist. These assistants would be only available for voice or text consultation given the current state of deployed technology. Robust telecommunications networks allowing for remote control of airliners along with control systems aboard airliners to allow such control, while technically feasible, currently do not exist and would require a sizeable investment in hardware and infrastructure to implement. This is certainly doable, but there is little evidence of any movement towards this future other than pure research. The trend is unmistakable though. Fewer humans will, over time, be involved in watching over your flight, and this may work out just fine. The advantages of automation are manifest: lower costs and higher productivity being two of the greatest. A third metric, however, safety, may be the fly in the ointment. 2016 was a record year in US commercial aviation as there were no fatalities on any US commercial airline anywhere in the world. It is also the seventh straight year that this feat has been attained. In 2015 that worked out to 7.6 billion miles flown with a (non-fatal) accident rate of 0.155 per 100,000 flight hours. There are about 24,000 commercial flights per day in the US. Flying is extremely safe and this is not by accident. The current state of safety in the airline industry has been achieved over the years through dogged research into human factors, technical standards, preventative maintenance, training, and accident investigations. Aviation policies and procedures for operators, controllers, and maintainers have years of development and history behind them. One of the best reasons to cheer the introduction of driverless cars is the promise of a reduction in the 35,000 annual US auto accident deaths. The promise of the pilotless airliner is mostly economic. Our commercial aviation system is already nearly as safe as can reasonably be accomplished short of parking airplanes. The burden of proof from a safety point of view will be upon those wishing to introduce large changes into this system for marginal economic gains. Measured in defects per operations accomplished, matching the current safety record will be a challenge. Not impossible, but the bar is pretty high. I personally find myself having to intervene multiple times a day to correct "errors" made by our current state of the art automation. My experience is not unique. Automation is not nearly as automatic as advertised. This record of course must improve before the system can be fully autonomous. The current pilot shortage, one of the justifications for increasing automation, is a mostly self inflicted injury by the US aviation industry compounded by Congress. It will eventually work itself out through rising wages and ab initio training programs for prospective pilots. It should also be noted that the shortage is currently only a problem facing regional airlines. Major airlines are poaching all the pilots they need from the regionals and military for the time being. To deflect the inevitable charge that I am merely a dinosaur expressing indignation at my own extinction, I'll say that I have every confidence that the goal of pilotless airliners will eventually be achieved given enough time and money. I also believe that it will not be nearly as cheap nor as easy as some acolytes of pilotless airplanes believe. If you'll notice, I haven't even touched on the acceptance of this idea by the flying public. I leave that for you, dear reader, to discuss in the comments. In any event, I'll be retired long before then.